Thousands of people fled the city ahead of the Iraqi advance. The Iraqi military moved into Kirkuk three weeks after the Kurdistan Region held a controversial independence referendum. They are aiming to retake areas under Kurdish control since Islamic State militants swept through the region. 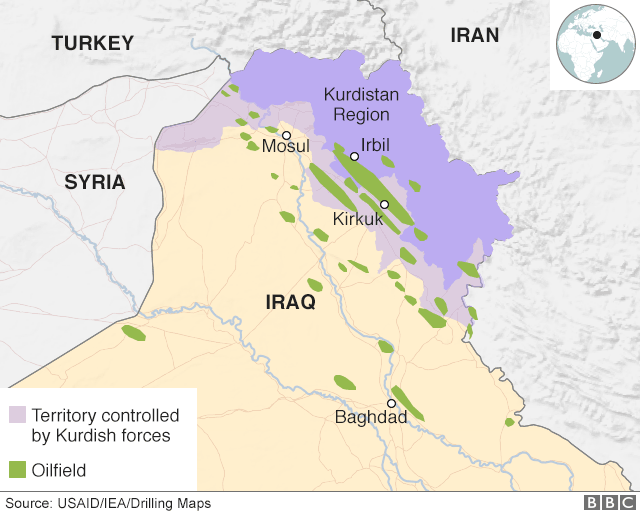 Residents of Kurdish-controlled areas, including Kirkuk, overwhelmingly backed secession from Iraq in a 25 September vote. While Kirkuk is outside Iraqi Kurdistan, people in the city were allowed to take part. -Kirkuk residents stuck in the middle -Iraqi Kurds decisively back independence -Independence: What is at stake? Iraq's prime minister, Haider al-Abadi, had denounced the vote as unconstitutional. But the Kurdistan Regional Government (KRG) insisted it was legitimate. US officials said they were "engaged with all parties in Iraq to de-escalate tension", while President Donald Trump said they were "not taking sides". "We don't like the fact that they're clashing," he added. Stop This Horror - NOW!